Epidemiology is the branch of medicine which deals with the incidence, distribution, and possible control of diseases and other factors relating to health. Epidemiological studies have revealed to us an an association between gut (intestinal) problems and skin disorders. A recent report indicated that small intestine bacterial overgrowth (SIBO), a condition involving inappropriate growth of bacteria in the small intestine, is 10 times more prevalent in people with acne rosacea than in healthy people, and the correction of the SIBO leads to clinical improvement of the acne. In addition to this, it has been reported 14% of patients with ulcerative colitis and 24% of patients with Crohn’s disease have skin manifestations. To add more supporting data to these observations, a study in 2012  reported a drug that is normally used to treat psoriasis (a chronic skin condition caused by an overactive immune system) is also effective for Crohn’s disease. Another report on Celiac disease (an immune disease in which people can’t eat gluten because it will damage their small intestine) also has cutaneous manifestations, such as dermatitis herpetiformis, which occurs in 1/4 of celiac sufferers. Celiacs also have increased frequency of oral mucosal lesions, alopecia (spot baldness), and vitiligo (loss of skin color in blotches). These medical observations reveal how our gut flora influences our skin. While reading this literature, I run across something called Substance P (a compound thought to be involved in the synaptic transmission of pain and other nerve impulses. It is a polypeptide with eleven amino-acid residues) is a neuropeptide produced in the gut, brain and skin that plays a major role in skin conditions. An altered gut microbiome promotes the release of substance P in both the gut and the skin, and probiotics can attenuate this response. The gut microbiota influences lipids and tissue fatty acid profiles, and may influence sebum production as well as the fatty acid composition of the sebum. This may explain why a Russian study found that 54% of acne patients have significant alterations to the gut flora , and a Chinese study involving patients with seborrheic dermatitis also noted disruptions in the normal gut flora. It has also been reported that probiotics can improve skin conditions. If the intestinal flora affects our skin health, then probiotics, the “good” live bacteria that helps keep your gut healthy, may also support a healthy immune system, boost weight management, improve mental health, and also improve our skin. 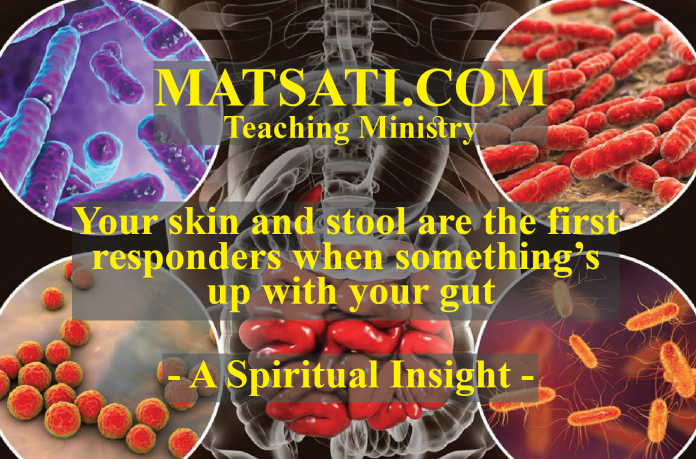 What kind of Spiritual Insights do we receive from this research? In Parashat Tzav we read about the person who is in a state of uncleanness, eats from the Lord’s sacrifices of the peace offering, and being cut off from his people as a result. The impurity spoken of here is either intrinsic or extrinsic inpurity. One who suffers from a skin disease or a flow has an intrinsic uncleanness. The one who touches a dead body, insect, or someone else who is unclean has suffered an extrinsic uncleanness. Ibn Ezra states that this type of uncleanness, the extrinsic form, may be cleansed by ritual immersion (the mikvah). He also comments upon the uncleanness that comes from within, at a deeper spiritual level, such an uncleanness can not be cleansed by the mikvah. The immersion (mikvah) would become ineffective if the impurity had penetrated inside of the body. This is illustrated in the Torah וְהַנֶּ֜פֶשׁ אֲשֶׁר־תֹּאכַ֣ל … וְטֻמְאָת֖וֹ עָלָ֑יו “and the soul that eats … and his impurity is upon him” informs us that joining what is holy (the sacrifice) with what is impure is under the penalty of karet (the cutting off, death). Yeshua the Messiah recognized this aspect of the Torah and ritual impurity when he taught about impurity according to Mark 7:14-23. He said in Mark 7:21 For from within the hearts of men come evil thoughts, sexual immorality, theft, murder, adultery, 7:22 greed, wickedness, deceit, debauchery, envy, slander, arrogance, and foolishness. 7:23 All these evils come from within, and these are what defile a man. (NASB) The idea is that impurity that comes from within (intrinsic) is at a greater level than that which comes from without (extrinsic). If we think about this for a moment. The extrinsic uncleanness is something that may be remedied by a ritual of purification. The intrinsic uncleanness on the other hand can only be remedied by a miracle of God! This is why Yeshua drew his discussion on uncleanness to a higher level pointing out that which is from within is a greater evil than to eat with unwashed hands. The parallel that we may see here to the scientific research is to what is going on internally effects what is going on externally. In the rabbinic literature, one of the conclusions the rabbis draw from the sin of lashon hara (gossip or evil speech) is that of tzaraat (leprosy). The idea is that sin which is within comes to the outside and becomes physically manifest by what is taking place on the inside. In Vayikra / Leviticus 7:21 we read, כא וְנֶפֶשׁ כִּי-תִגַּע בְּכָל-טָמֵא בְּטֻמְאַת אָדָם אוֹ | בִּבְהֵמָה טְמֵאָה אוֹ בְּכָל-שֶׁקֶץ טָמֵא וְאָכַל מִבְּשַֹר-זֶבַח הַשְּׁלָמִים אֲשֶׁר לַיהוָֹה וְנִכְרְתָה הַנֶּפֶשׁ הַהִוא מֵעַמֶּיהָ: 7:21 Moreover the soul that shall touch any unclean thing, as the uncleanness of man, or any unclean beast, or any abominable unclean thing, and eat of the flesh of the sacrifice of peace offerings, which pertain unto the Lord, even that soul shall be cut off from his people. (NASB) The rabbis ask the question about the way this text is written “why does the Torah chose to write וְנֶפֶשׁ כִּי-תִגַּע, a feminine way of describing the contact instead of writing איש כי יגע the parallel masculine form?” Correspondingly, why does Moshe write וְאָכַל in masculine form as opposed to the feminine form ואכלה? (Or HaChaim on Vayikra / Leviticus 7:20 Part 4) The reason Moshe wrote the text the way he did was to reveal to us how contact with ritual impurity was intention and not merely accidental. This draws a powerful context to Yeshua’s words in Mark 7 as 7:21 For from within the hearts of men come evil thoughts, sexual immorality, theft, murder, adultery, 7:22 greed, wickedness, deceit, debauchery, envy, slander, arrogance, and foolishness. 7:23 All these evils come from within, and these are what defile a man. (NASB) The Torah is written in this way to reveal to us that contact with impurity was intentional and not merely accidental. This leads us to understand how the person becomes unclean by what comes from inside, the sinfulness of his heart. This is a type of intrinsic uncleanness, and this type of uncleanness can only be remedied by a miracle of God! The use of the word נֶפֶשׁ (soul) in the Torah alludes to the intentional act, this is the why Moshe writes this way instead of using איש (man) in a more general sense. Here in Vayikra / Leviticus 7:20 the word נֶפֶשׁ was used instead of איש. The word נֶפֶשׁ (soul) alludes to the awareness of the sinner of what he is doing. This draws us back to Parashat Vayikra and that of unintentional sins verses intentional sins, there is no sacrifice for intentional sins. Again, in order to receive forgiveness for intentional sins, this intentional uncleanness, this thing which comes from the heart of a man, from his nefesh (נֶפֶשׁ, soul) this can come only by a miracle of God! Here is where Teshuvah (Repentance) is necessary which is a work of God upon our hearts leading us to turn from our wicked ways. The reason the Scriptures speak of the Lord God being long suffering with His people is to allow time for repentance from sins and turning from one’s wicked ways. The word נֶפֶשׁ indicates that the person who committed the trespass cannot claim unawareness of doing something wrong. In the scientific research, the recommendation for problems with the intestinal flora that leads to all of these other disorders is to supplement the diet with probiotics. From a spiritual aspect, we need to supplement our diet with the Word of God and faith in the Messiah! In these verses from Vayikra / Leviticus 7:20-21 on uncleanness, the word נֶפֶשׁ implies that the guilty party was aware of touching something he should not have touched (verse 7:21) or he was aware that he ate something he should not have eaten (verse 7:20), this exposes the hypocrisy of men in their hearts and why Yeshua said in Mark 7 what he did concerning the true source of uncleanness. We need God’s help to overcome sin in our lives! The reason the Torah wrote these things in this way was to teach us that God loves us and desires for us to turn to His way of life and to His Messiah Yeshua. The Lord God needs to cleans us from the inside out. If the source (intrinsic) is not made clean, the exterior (extrinsic) will remain unclean too because that which is within is coming out being manifest in our actions. This is why the Torah makes such a distinction between extrinsic and intrinsic uncleanness! The Torah expounds upon the altar of God extensively and states that the priests used flames from the altar to to do many things, to light the menorah, to burn the incense on the golden altar, and that fire was never to be extinguished. Any fire that was brought from a source other than the altar was considered strange fire. Here in relation to that which is unclean, the altar may be compared to a man’s heart, a place which either contains great wickedness, or the utter holiness of God! Just as the fire on the altar needed to be kept burning, so too we must keep our hearts aflame with the love of God! It is in this point that Yeshua teaches us the Torah command, that it is our duty to love the Lord our God with all our hearts, souls, and minds, and to show that love by loving our neighbor as ourselves. The altar in the Tabernacle demonstrates what happens in our hearts, fire naturally burns low, and it is at this time we should all the more strive to attend to our duties, to love others compassionately, and never let the love of God be extinguished. (See the previous study for more on this topic!) The scientific research describes the deficiency of what is on the inside effecting what is on the outside (i.e. gutt bacterial and skin disorders). The same may be said of us, being deficient of God, His Spirit, and His Messiah in our lives. The Lord God Almighty, His kingdom, His power is here right now to help us overcome anything in the name of His Son Yeshua the Messiah! He will help us if we seek Him!